got around to doing that. put me over the top -- I HAD to have a banjo that played an octave lower! set out to see what couldn't be built out of "available parts" -- thus this article. This instrument was easily built in 5 days of spare time. CLICK HERE to see a YouTube video of this cello-banjo being played. Here are a couple of photos that will help understand the construction better. Other than string-length, neck angle & fret-placement, not much is fussy or critical. That's about all that's required other than a few screws & minor odds/ends! altho some power tools would surely speed things up. - a thin-bladed saw is needed to saw the fret-slots to the appropriate thickness. experiment on scrap to get the proper width so that the frets fit tightly. A) Remove all the hardware & heads etc from the drum. hardware-store bolts of the appropriate thread & length (easy to find). rigidity to help keep the rim/skin tight. cut into the side of the drum (see photos). the nut. The part of the neck that comprises the tuning head measures 56mm by 130mm. First off, shape the end of the neck to match the inside curve of the drum. successfully did not use any glue here -- the screws by themselves are amply strong. to allow drum head/rim clearance. right is quite important to the ease of playing this banjo. Now remove the temporarily installed neck & get ready to mount the frets. to make the fret-slots the proper width -- not too tight nor too loose. simple jig I built that made the job duck-soup easy (see photo-2 above). 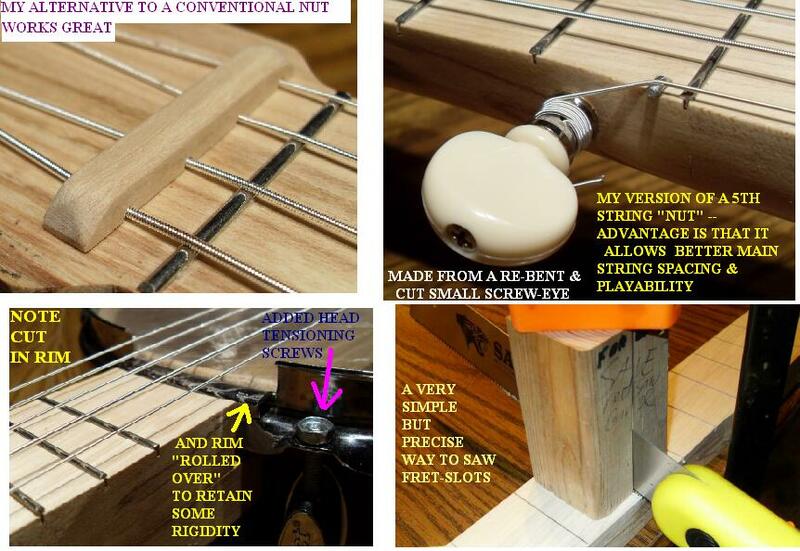 mounting a fret where a nut would normally be located (see photos). few times using scrap hardwood before making the hole in the actual instrument. screwdriver whose blade end was the same taper as that of the 5th peg shaft. screw-driver blade & ground or filed it until it was the proper taper. Carefully worry thehole larger until the 5th peg fits very snugly. up playing it'd be because of a nut on their guitar or whatever that was too high! Seiously - I've seen this countless times -- even amongst people who should know better! the real culprit. Not nearly enough attention is paid to proper nut adjustment. let's come up with something better I say. the end of the "drum/neck mounting piece". fret to the bottom of the strings (I use the middle stirng) is about 4 millimeters. playing strings so the latter wouldn't be as "crowded". Worked nicely. The "nut"
is fashioned from a very small eye-hook that I cut & then bent into an "L" shape. bit smaller than usual so the "L" retains it's position & doesn't rotate. on a piece of scrap hardwood. can be hacked out of a scrap of wood in minutes that will work fine. 5th string (at the bridge) as measures 49 mm. 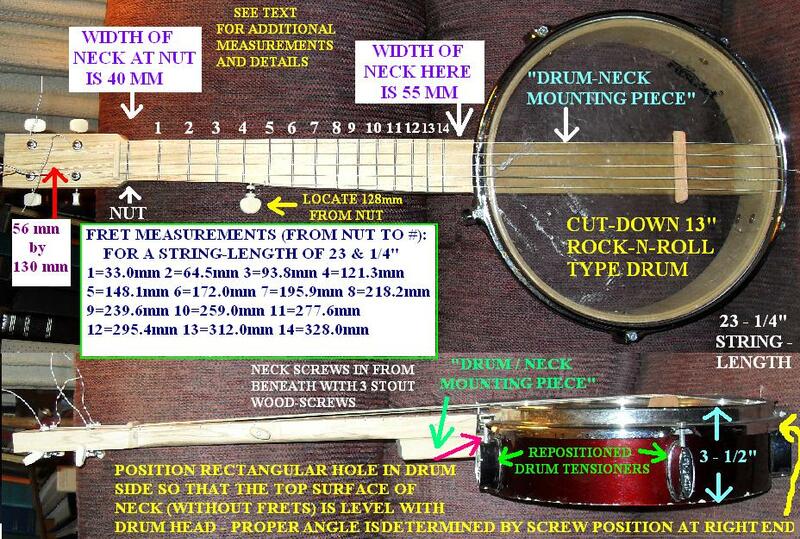 The distance between the 1st and 4th string at the nut measures 30 mm. information, fixed typos & mistakes etc. Let me know if you build one -- LOT of fun for very little effort & expense..
or left as shown in the photos.